Noninvasive positive-pressure ventilation is a type of mechanical ventilation that does not require an artificial airway. Studies published in the 1990s that evaluated the efficacy of this technique for the treatment of diseases as chronic obstructive pulmonary disease, congestive heart failure and acute respiratory failure have generalized its use in recent years. Important issues include the selection of the ventilation interface and the type of ventilator. Currently available interfaces include nasal, oronasal and facial masks, mouthpieces and helmets. Comparisons of the available interfaces have not shown one to be clearly superior. Both critical care ventilators and portable ventilators can be used for noninvasive positive-pressure ventilation; however, the choice of ventilator type depends on the patient's condition and therapeutic requirements and on the expertise of the attending staff and the location of care. The best results (decreased need for intubation and decreased mortality) have been reported among patients with exacerbations of chronic obstructive pulmonary disease and cardiogenic pulmonary edema. Noninvasive positive-pressure ventilation includes various techniques for augmenting alveolar ventilation without an endotracheal airway. The clinical application of noninvasive ventilation by use of continuous positive airway pressure alone is referred to as “mask CPAP,” and noninvasive ventilation by use of intermittent positive-pressure ventilation with or without continuous positive airway pressure is called noninvasive positive-pressure ventilation. A full face mask is often a superior choice for patients with predominant mouth breathing because it reduces oral air leakage. The face mask permits mouth breathing, and it delivers higher ventilation pressures with less leakage and requires less patient cooperation than other interfaces. Compared with nasal masks, the more common use of full-face masks for the treatment of chronic respiratory failure is a reflection of better quality of ventilation (at least initially) in terms of improved minute ventilation and blood gases.4,5 However, face masks generally increase claustrophobia, impede communication, limit oral intake and expectoration of airway secretions and increases dead space, which may cause CO2 rebreathing. Pressure support ventilation allows the patient to control inspiratory and expiratory times while providing a set pressure. In conjunction with patient effort and respiratory mechanics, the set pressure determines the inspiratory flow and tidal volume. The combination of inspiratory assistance with expiratory positive airway pressure (also known as bilevel ventilation or bilevel positive airway pressure) is thought to reduce the work of breathing and to alleviate respiratory distress more effectively than continuous positive airway pressure alone. Several studies and systematic reviews have assessed the efficacy of noninvasive positive-pressure ventilation for exacerbations of chronic obstructive pulmonary disease.14–16 A systematic review performed by Ram and colleagues15 included 8 studies. Compared with usual care alone, noninvasive positive-pressure ventilation was associated with lower mortality (relative risk [RR] 0.41, 95% confidence interval [CI] 0.26 to 0.64) (Figure 1), decreased need for intubation (RR 0.42, 95% CI 0.31 to 0.59), lower likelihood of treatment failure (RR 0.51, 95% CI 0.38 to 0.67) and, at 1 hour, greater improvements in pH (weighted mean difference 0.03, 95% CI 0.02 to 0.04), PaCO2 (weighted mean difference –0.40 mm Hg, 95% CI –0.78 to –0.03) and respiratory rate (weighted mean difference –3.08 breaths per minute, 95% CI –4.26 to –1.89). Noninvasive ventilation was associated with fewer treatment-related complications (RR 0.38, 95% CI 0.24 to 0.60) and a shorter duration of hospital stay (weighted mean difference –3.24 days, 95% CI –4.42 to –2.06). Similar conclusions were reported in subgroup analysis by Keenan and colleauges,17 who found that these beneficial effects occurred only in cases with severe exacerbations and did not occur in cases with mild exacerbations. Figure 1: This forest plot represents relative risk estimates comparing noninvasive positive-pressure ventilation with continuous ventilation. The information was assembled from systematic reviews using varying numbers of randomized controlled trials to generate summary statistics.15,30 As compared to invasive ventilation, noninvasive methods are superior in decreasing mortality for patients with specific conditions. NPPV = noninvasive positive-pressure ventilation. Noninvasive positive-pressure ventilation has been compared with invasive mechanical ventilation in a randomized controlled trial18 that included 49 cases of chronic obstructive pulmonary disease with severe acute respiratory failure in which ventilatory support was deemed necessary. Respiratory failure was more severe in the cases enrolled in this study compared with previous studies. In addition, in previous trials noninvasive positive-pressure ventilation was used at an earlier stage (indicated by an average pH on study entry of 7.20). Within the noninvasive positive-pressure ventilation group, treatment failed in 12 (52%) cases in which invasive mechanical ventilation was required. The authors found no significant differences between the treatment and control groups for mortality (intensive care unit or hospital), overall complications, duration of mechanical ventilation and length of stay in an intensive care unit. At 12-months follow-up, the rate of hospital re-admissions was lower in the noninvasive positive-pressure ventilation group than in the control group. Additional evidence of the long-term benefits of noninvasive positive-pressure ventilation was presented by Confalonieri and colleagues.19 Among patients with chronic obstructive pulmonary disease exacerbations, patients who received noninvasive positive-pressure ventilation had increased survival at 6 months (treatment 71% v. control 51%, p < 0.05) and at 1 year (treatment 71% v. control 50%, p < 0.05). Therefore, for selected patients with exacerbation of chronic obstructive pulmonary disease, the early use of noninvasive positive-pressure ventilation as a first-line therapy is associated with increased survival and decreased length of stay in hospital. Although the use of this therapy at advanced stages of acute respiratory failure is more likely to fail, a trial of noninvasive positive-pressure ventilation before proceeding to intubation and invasive ventilation does not seem to harm the patient and may be attempted cautiously. However, the patient should be closely monitored in an intensive care unit and, if required, intubation should be performed without excessive delay. A schematic approach, initially proposed by Sinuff and colleauges,20 for the use of noninvasive positive-pressure ventilation in cases with exacerbations of chronic obstructive pulmonary disease is shown in Figure 2. There is limited available information about the withdrawal of noninvasive positive-pressure ventilation; thus, the strategy proposed by Sinuff and colleauges21 may be helpful in cases of chronic obstructive pulmonary disease (Figure 3). The low incidence of acute respiratory failure secondary to status asthmaticus2 may be the reason why few studies have evaluated the efficacy of noninvasive positive-pressure ventilation in this setting. In a prospective study involving 17 patients with status asthmaticus, Meduri and colleagues22 reported that noninvasive positive-pressure ventilation (by use of a face mask) with a low inspiratory pressure is highly effective in correcting gas exchange abnormalities. Of the 17 included patients, 2 (12%) required intubation and none developed complications. In a retrospective study involving 33 patients who had been admitted to an intensive care unit for status asthmaticus, Fernández and colleagues23 reported that 11 patients received invasive mechanical ventilation and 22 patients received noninvasive positive-pressure ventilation. They found no differences in the median length of stay in an intensive care unit (4.5 days v. 3 days) or hospital (15 days v. 12 days). They also found no difference in mortality (0% v. 4%). The application of noninvasive positive-pressure ventilation in patients suffering from status asthmaticus remains controversial, despite some interesting and very promising preliminary results. Large randomized controlled trials are needed to determine the role of noninvasive positive-pressure ventilation in status asthmaticus. The best specific respiratory support for treatment of acute respiratory failure due to cardiogenic pulmonary edema remains unclear. In its guidelines for the diagnosis and treatment of acute heart failure, the European Society of Cardiology recommend the use of noninvasive positive-pressure ventilation (recommendation: class IIA, level of evidence: A).26 Three randomized controlled trials have suggested that the use of noninvasive intermittent positive-pressure ventilation in the setting of acute cardiogenic pulmonary edema27–29 decreases the need for intubation; however, this does not translate into reduced mortality or improved long-term function. In a recent meta-analysis30 that included a total of 29 randomized controlled trials of continuous positive airway pressure and bilevel positive airway pressure, Peter and colleauges reported on 12 studies that compared continuous positive airway pressure with standard care, 7 that compared bilevel positive airway pressure with standard care and 10 that compared continuous positive airway pressure with bilevel positive airway pressure. Continuous positive airway pressure was associated with a significant reduction in hospital mortality compared with standard therapy (RR 0.59, 95% CI 0.38 to 0.90, p = 0.015). However, the effect of bilevel positive airway pressure was not significant (RR 0.63, 95% CI 0.37 to 1.10, p = 0.11). Both continuous positive airway pressure and bilevel positive airway pressure were associated with significant reductions in the need for invasive mechanical ventilation compared with standard therapy (continuous positive airway pressure v. standard therapy RR 0.44, 95% CI 0.29 to 0.66, p = 0.0003; bilevel positive airway pressure v. standard therapy RR 0.50, 95% CI 0.27 to 0.90, p = 0.02). Compared with standard therapy, neither continuous positive airway pressure nor bilevel positive airway pressure had an effect on new myocardial infarction rates or length of hospital stay. Noninvasive positive-pressure ventilation has been used in patients with acute respiratory failure that occurred postsurgery or that occurred because of community-acquired pneumonia. A systematic review by Keenan and colleagues31 analyzed the efficacy of this technique in patients with hypoxemic respiratory failure. They reported on the outcome of 2 trials that included immunocompromised patients, 1 that included patients who had undergone lung resection, 1 that included patients with community-acquired pneumonia, 1 that included patients with post-extubation respiratory failure and 3 that included a heterogeneous groups of patients. Overall, noninvasive positive-pressure ventilation was associated with a significantly lower rate of intubation compared with standard management (absolute risk reduction 23%, 95% CI 10% to 35%). The results were similar for the subgroup of 6 trials that did not include patients with chronic obstructive pulmonary disease or cardiogenic pulmonary edema (risk reduction 24%, 95% CI 8% to 36%). Also, noninvasive positive-pressure ventilation was associated with a reduction in mortality in intensive care units of 17% (95% CI 8% to 26%), with the same subgroup of 6 trials reporting a similar reduction of 16% (95% CI 5% to 27%). Following publication of the meta-analysis by Keenan and colleauges,31 2 additional studies have been performed.32,33 Squadrone and colleagues32 examined the effectiveness of continuous positive airway pressure in patients with acute hypoxemia after elective major abdominal surgery. Patients who received oxygen and continuous positive airway pressure had a lower intubation rate (RR 0.099, 95% CI 0.01 to 0.76) and none of these patients died in hospital, compared with 3 deaths among the group of patients who received oxygen alone (p = 0.12).32 The study by Honrubia and colleagues33 included 64 patients with acute respiratory failure from various causes. These patients were randomized to receive either noninvasive positive-pressure ventilation through a face mask with pressure support and positive end-expiratory pressure or to receive conventional invasive ventilation. Noninvasive ventilation reduced the need for intubation (relative risk reduction 43%). Mortality in intensive care units was 23% in the noninvasive group and 39% in the conventional therapy group (p = 0.09). In recent years, useful guidelines for weaning from mechanical ventilation have developed; however, the rate of extubation failure (the need for reintubation within 48–72 hours) is close to 18%.40 The main cause of extubation failure is the development of respiratory failure within a few hours. Noninvasive positive-pressure ventilation has been evaluated in the prevention and management of this condition. Until recently, experience with noninvasive positive-pressure ventilation was limited to observational studies with physiologic evaluation as the main objective. In a randomized controlled trial that included 93 patients, Jiang and colleagues41 reported on the outcomes of 56 patients who received elective extubation and 37 patients who received unplanned extubation. After extubation, patients were randomly assigned to receive either bilevel positive airway pressure or unassisted oxygen therapy. They found no significant difference in the rate of reintubation for either technique (noninvasive positive-pressure ventilation 28% v. oxygen therapy 15%). Nava and colleagues42 performed a randomized controlled trial that included 97 consecutive patients who required more than 48 hours of mechanical ventilation and who were considered at risk for post-extubation respiratory failure. After a successful weaning trial, patients were randomized to receive either noninvasive positive-pressure ventilation or standard medical therapy. Compared with standard therapy, there was a lower rate of reintubation among those in the noninvasive positive-pressure ventilation group (RR 0.34, 95% CI 0.12 to 0.98). Noninvasive positive-pressure ventilation did not affect overall mortality in the intention-to-treat analysis, but the authors reported reduced mortality in the intensive care unit setting owing to a reduced need for reintubation. In 2006, Ferrer and colleauges43 conducted a randomized controlled trial that included 162 patients receiving mechanical ventilation who tolerated a spontaneous breathing trial but who were at increased risk for respiratory failure after extubation. After extubabtion, patients were randomly allocated to receive 24 hours of either noninvasive positive-pressure ventilation or conventional management with oxygen therapy. Among patients who received noninvasive positive-pressure ventilation, respiratory failure after extubation was less frequent (RR 0.51, 95% CI 0.28 to 0.91), but 90-day mortality was not reduced. Subgroup analysis showed that the use of noninvasive positive-pressure ventilation was associated with reduced mortality among patients with hypercapnia. Based on these studies, the early use of noninvasive positive-pressure ventilation can prevent respiratory failure after extubation and decrease the need for reintubation. However, further studies that better define the population of patients at risk for respiratory failure after extubation may be necessary. The treatment of respiratory failure after extubation must be considered separately. Two randomized controlled trials that examined the effectiveness of noninvasive positive-pressure ventilation in this context have been published. Keenan and colleagues44 enrolled 81 patients who required ventilatory support for more than 2 days and who developed respiratory distress within 48 hours of extubation. Patients were randomly assigned to receive standard medical therapy alone or to receive noninvasive positive-pressure ventilation by use of a face mask and standard medical therapy. The authors found no difference in the rate of reintubation (RR 1.04, 95% CI 0.78 to 1.38) or hospital mortality (RR 0.99, 95% CI 0.52 to 1.91). Using similar methodology, Esteban and colleagues45 performed a multicentre international study that included 221 patients. In this study, there was no difference in the need for reintubation among patients receiving noninvasive positive-pressure ventilation and those receiving standard therapy (RR 0.99, 95% CI 0.76 to 1.30). However, mortality in the intensive care unit was higher in the noninvasive positive-pressure ventilation group compared with the standard-therapy group (RR 1.78, 95% CI 1.03 to 3.20). A possible explanation for this difference is delayed reintubation among patients who received noninvasive positive-pressure ventilation. The median time from respiratory failure to reintubation was longer in the noninvasive positive-pressure ventilation group compared with standard care (12 h v. 2 h 30 min). In light of these studies, noninvasive positive-pressure ventilation is not effective for management of post-extubation respiratory failure, and delayed reintubation may increase mortality. Noninvasive positive-pressure ventilation has been used as an alternative to invasive ventilation in patients with a “do-not-intubate” order. A recent study46 that included 114 patients with a do-not-intubate order and acute respiratory failure found that 43% of patients survived to hospital discharge. The patient's underlying condition was an important determinant of survival. Mortality was 25% among patients with chronic heart failure and 48% among patients with chronic obstructive pulmonary disease. Mortality was highest among patients with cancer and pneumonia (77% and 74% respectively). Similar results were reported by Schettino and colleagues47 in a prospective observational study that included 131 patients with acute respiratory failure and a do-not-intubate order in a general hospital. They reported an overall mortality of 64.9%. Hospital mortality was 37.5% among patients with chronic obstructive pulmonary disease exacerbations, 39% among those with cardiogenic pulmonary edema, 68% among those with nonchronic obstructive pulmonary disease hypercapnic respiratory failure, 77% among those with post-extubation respiratory failure and 88% among patients with hypoxemic acute respiratory failure. Advanced cancer was present in 40 patients, and it was associated with increased risk of death (mortality 85%, odds ratio [OR] 4.44, 95% CI 1.70 to 11.62, p = 0.002). Although noninvasive ventilation is very useful in many settings, it is not appropriate for all patients. There are a number of absolute and relative contraindications for this mode of ventilation (Box 3). Noninvasive ventilation for respiratory support requires that patients are cooperative and able to protect their airway. Therefore, substantially impaired consciousness or an inability to protect the upper airway should lead physicians to choose another type of respiratory support. It is also unsafe to use facial masks for patients who are vomiting repeatedly or who are bleeding from the airways or the upper gastrointestinal tract. Vomiting or bleeding into the facial mask will invariably predispose the patient to aspiration. Considerable airway secretions pose a similar problem. One of the potential complications of noninvasive positive-pressure ventilation is abdominal distention due to the air forced into the stomach under positive pressure. If a patient has anastomoses in the upper gastrointestinal tract, physicians should avoid the possibility of disrupted suture lines because of abdominal distention. Finally, noninvasive positive-pressure ventilation has not been shown to benefit patients with acute coronary syndromes. The combination of acute myocardial ischemia with hypoxemic respiratory failure and possibly hemodynamic instability may result in worsened myocardial ischemia compared to invasive modalities for which one would expect more immediate control of oxygenation and hemodynamic status. Noninvasive positive-pressure ventilation is effective for reversing acute respiratory failure and preventing hospital mortality in patients with a do-not-intubate order whose primary diagnosis is chronic obstructive pulmonary disease or cardiogenic pulmonary edema. It is a less successful therapy for patients with hypoxemic acute respiratory failure or terminal cancer. Robust evidence from randomized controlled trials is lacking. Contributors: All of the authors contributed to the conception and design of the article and to the interpretation of the data. All of the authors drafted the article and revised it for important intellectual content and gave approval of the version to be published. Mehta S, Hill NS. Noninvasive ventilation. Am J Respir Crit Care Med 2001;163:540-77. Esteban A, Anzueto A, Frutos-Vivar F, et al. Characteristics and outcomes in adult patients receiving mechanical ventilation: a 28-day internacional study. JAMA 2002;287:345-55. Schonhofer B, Sortor-Leger S. Equipment needs for noninvasive mechanical ventilation. Eur Respir J 2002;20:1029-36. Meduri GU, Turner RE, Abou-Shala N, et al. Noninvasive positive-pressure ventilation via face mask. First-line intervention in patients with acute hypercapnic and hypoxemic respiratory failure. Chest 1996;109:179-93. Navalesi P, Fanfulla F, Frigerio P, et al. Physiologic evaluation of noninvasive mechanical ventilation delivered with three types of masks in patients with chronic hypercapnic respiratory failure. Crit Care Med 2000;28:1785-90. Chiumello D, Pelosi P, Carlesso E, et al. Noninvasive positive-pressure ventilation delivered by helmet vs. standard face mask. Intensive Care Med 2003;29:1671-9. Costa R, Navalesi P, Antonelli M, et al. Physiologic evaluation of different levels of assistance during noninvasive ventilation delivered through a helmet. Chest 2005;128:2984-90. Navelesi P, Costa R, Ceriana P, et al. Noninvasive ventilation in chronic obstructive pulmonary disease patients: helmet versus facial mask. Intensive Care Med 2007;33:74-81. Carlucci A, Richard JC, Wysocki M, et al. Noninvasive versus conventional mechanical ventilation. An epidemiologic survey. Am J Respir Crit Care Med 2001;163:874-80. Lin M, Yang YF, Chiang HT, et al. Reappraisal of continuous positive airway pressure therapy in acute cardiogenic pulmonary edema. Short-term results and long-term follow-up. Chest 1995;107:1379-86. Petrof BJ, Legare M, Goldberg P, et al. Continuous positive airway pressure reduces work of breathing and dyspnea during weaning from mechanical ventilation in severe chronic obstructive pulmonary disease. Am Rev Respir Dis 1990;141:281-90. Evans TW. International Consensus Conferences in Intensive Care Medicine. Noninvasive positive-pressure ventilation in acute respiratory failure. Intensive Care Med 2001;27:166-78. British Thoracic Society Standards of Care Committee. Noninvasive ventilation in acute respiratory failure. Thorax 2002;57:192-211. Peter JV, Moran JL, Phillips-Hughes J, et al. Noninvasive ventilation in acute respiratory failure — a meta-analysis update. Crit Care Med 2002;30:555-62. Ram FS, Picot J, Lightowler J, et al. Noninvasive positive-pressure ventilation for treatment of respiratory failure due to exacerbations of chronic obstructive pulmonary disease. Cochrane Database Syst Rev 2004;(3):CD004104. Collaborative Research Group of Noninvasive Ventilation for Chronic Obstructive Pulmonary Disease. Early use of noninvasive positive-pressure ventilation for acute exacerbations of chronic obstructive pulmonary disease: a multicenter randomized controlled trial. Chin Med J (Engl) 2005;118:2034-40. Keenan SP, Sinuff T, Cook DJ, et al. Which patients with acute exacerbations of chronic obstructive pulmonary disease benefit from noninvasive positive-pressure ventilation? A systematic review of the literature. Ann Intern Med 2003;138:861-70. Conti G, Antonelli M, Navalesi P, et al. Noninvasive versus conventional mechanical ventilation in patients with chronic obstructive pulmonary disease after failure of medical treatment in the ward: a randomized trial. Intensive Care Med 2002;28:1701-7. Confalonieri M., Parigi P, Scartabellati A, et al. Noninvasive mechanical ventilation improves the immediate and long-term outcome of COPD patients with acute respiratory failure. Eur Respir J 1996;9:422-30. Sinuff T, Cook DJ, Randall J, et al. 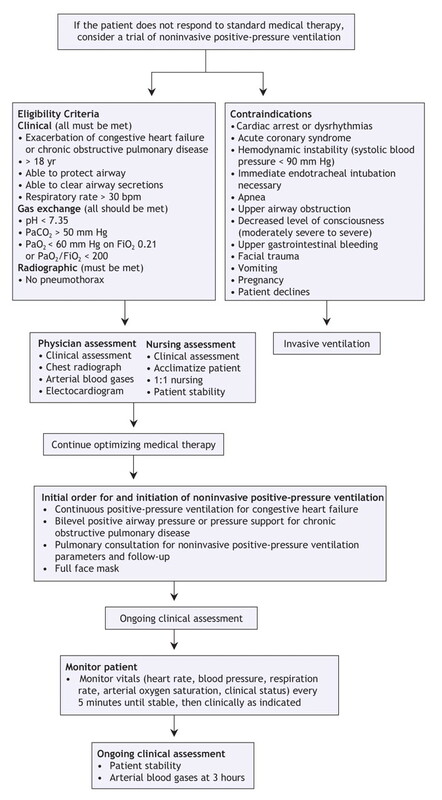 Evaluation of a practice guideline for noninvasive positive-pressure ventilation for acute respiratory failure. Chest 2003;123:2062-73. Sinuff T, Keenan S. Clinical practice guideline for the use of noninvasive positive-pressure ventilation in COPD patients with acute respiratory failure. J Crit Care 2004;19:82-91. Meduri GU, Cook TR, Turner RE, et al. Noninvasive positive-pressure ventilation in status asthmaticus. Chest 1996;110:767-74. Fernández MM, Villagra A, Blanch L, et al. Noninvasive mechanical ventilation in status asthmaticus. 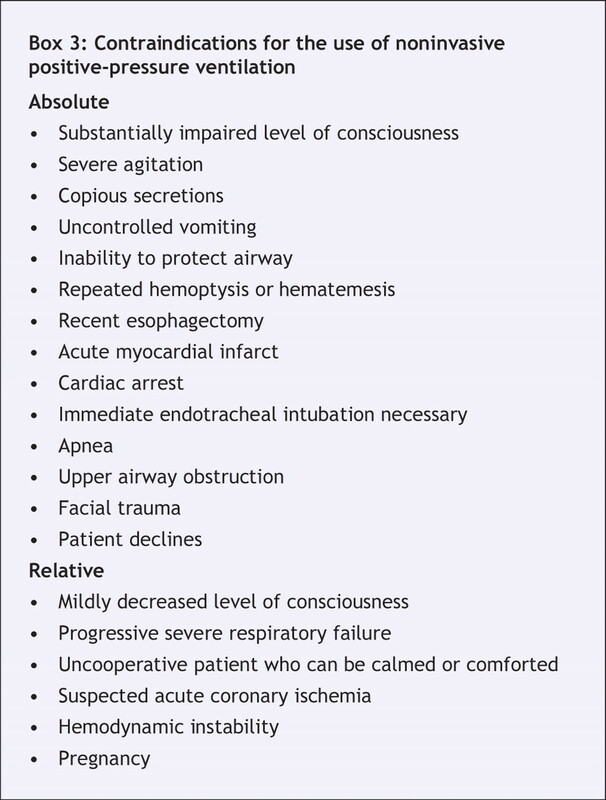 Intensive Care Med 2001;27:486-92. Ram FS, Wellington S, Rowe B, et al. Noninvasive positive-pressure ventilation for treatment of respiratory failure due to severe acute exacerbations of asthma. Cochrane Database Syst Rev 2005;(3):CD004360. Soroksky A, Satv D, Shpirer I. A pilot prospective, randomized, placebo-controlled trial of bilevel positive airway pressure in acute asthmatic attack. Chest 2003;123:1018-25. Nieminen MS, Bohm M, Cowie MR, et al. Executive summary of the guidelines on the diagnosis and treatment of acute heart failure. Eur Heart J 2005;26:384-416. Masip J, Betbesé AJ, Páez J. Noninvasive pressure-support ventilation versus conventional oxygen therapy in acute cardiogenic pulmonary oedema a randomized trial. Lancet 2000;356:2126-32. Sharon A, Shpirer I, Kaluski E, et al. High-dose intravenous isosorbide-dinitrate is safer and better than BiPAP ventilation combined with conventional treatment for severe pulmonary edema. J Am Coll Cardiol 2000;36:832-7. Mehta S, Jay GD, Woolard RH, et al. Randomized prospective trial of bilevel versus continuous positive airway pressure in acute pulmonary edema. Crit Care Med 1997;25:620-8. Peter JV, Moran JL, Hughes JP, et al. Effect of noninvasive positive-pressure ventilation (NIPPV) on mortality in patients with acute cardiogenic pulmonary oedema: a meta-analysis. Lancet 2006;367:1155-63. Keenan S, Sinuff T, Cook D, et al. Does noninvasive positive-pressure ventilation improve outcome in acute hypoxemic respiratory failure? A systematic review. Crit Care Med 2004;32:2516-23. Squadrone V, Coha M, Cerutti E, et al. Continuous positive airway pressure for treatment of postoperative hypoxemia: a randomized controlled trial. JAMA 2005;293:589-95. Honrubia T, García López FJ, Franco N, et al. Noninvasive vs conventional mechanical ventilation in acute respiratory failure: a multicenter, randomized controlled trial. 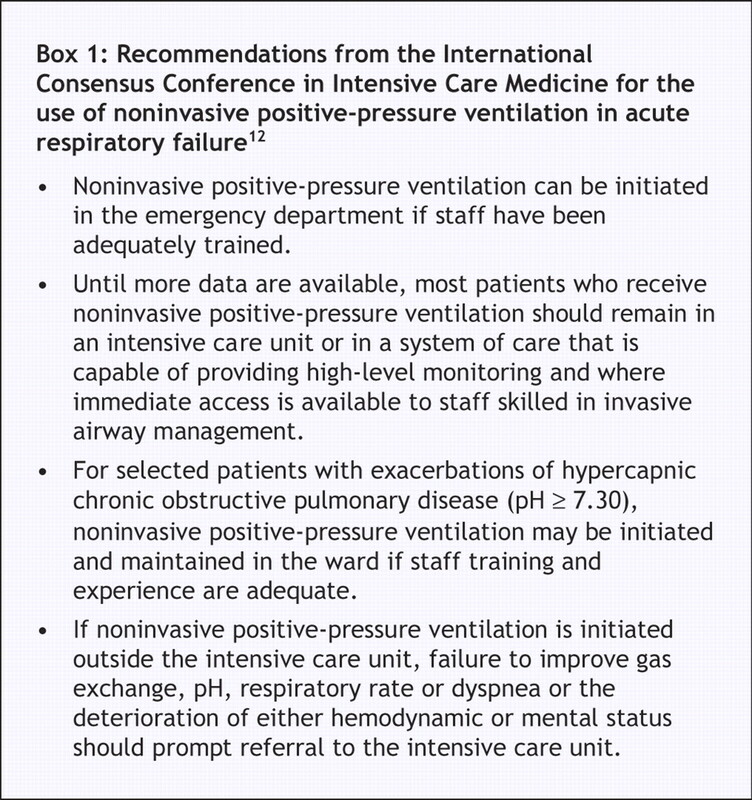 Chest 2005;128:3916-24.
International Consensus Conference in Intensive Care Medicine: non-invasive positive-pressure ventilation in acute respiratory failure. Am J Respir Crit Care Med 2001;163:283-91. Nava S, Ambrosino N, Clini E. Noninvasive mechanical ventilation in the weaning of patients with respiratory failure due to chronic obstructive pulmonare disease. A randomized controlled trial. Ann Intern Med 1998;128:721-8. Girault C, Daudenthun I, Chevron V, et al. Noninvasive ventilation as a systematic extubation and weaning technique in acute-on-chronic respiratory failure: a prospective, randomized controlled study. Am J Respir Crit Care Med 1999;160:86-92. Ferrer M, Esquinas A, Arancibia F, et al. 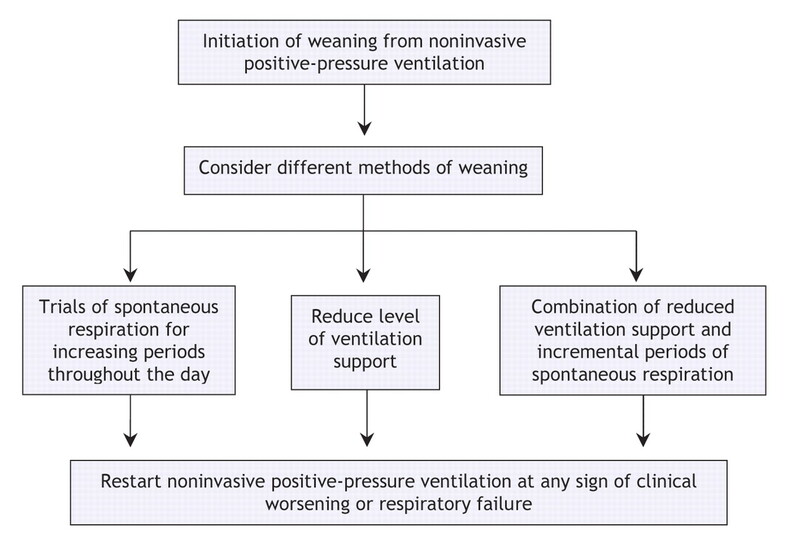 Noninvasive ventilation during persistent weaning failure: a randomized controlled trial. Am J Respir Crit Care Med 2003;168:70-6. Burns KE, Adhikari NK, Meade MO. Noninvasive positive-pressure ventilation as a weaning strategy for intubated adults with respiratory failure. Cochrane Database Syst Rev 2003;(4):CD004127. Benito S. Ventilación no invasiva en el fracaso del weaning. Med Intensiva 2004;28:18-9. Gil B, Frutos-Vivar F, Esteban A. Deleterious effects of reintubation of mechanically ventilated patients. Clinical Pulmonary Medicine 2003;10:226-30. Jiang JS, Kao SJ, Wang SN. Effect of early application of biphasic positive airway pressure on the outcome of extubation in ventilator weaning. Respirology 1999;4:161-5. Nava S, Gregoretti C, Farfulla F, et al. Noninvasive ventilation to prevent respiratory failure after extubation in high-risk patients. Crit Care Med 2005;33:2465-70. Ferrer M, Valencia M, Nicolás JM, et al. Early noninvasive ventilation averts extubation failure in patients at risk. Am J Respir Crit Care Med 2006;173:164-70. Keenan SP, Powers C, McCormack DG, et al. Noninvasive positive-pressure ventilation for postextubation respiratory distress: a randomized controlled trail. JAMA 2002:287;3238-44. Esteban A, Frutos-Vivar F, Ferguson ND, et al. Noninvasive positive-pressure ventilation for respiratory failure after extubation. N Engl J Med 2004;350:2452-60. Levy M, Tanios MA, Nelson D, et al. Outcomes of patients with do-not-intubate orders treated with noninvasive ventilation. Crit Care Med 2004;32:2002-7. Schettino G, Altobelli N, Kacmarek RM. Noninvasive ventilation reverses acute respiratory failure in selected “do-not-intubate” patients. Crit Care Med 2005;33:1976-82.